You keep coming without tiring as well, huh. Don’t stretch yourself to the breaking point and collapse, because I’ll be annoyed if I have to take care of more things. Also, I’ll give you this. Be sure to use it carefully, alright? I won’t let you off if you use it for something weird. This entry was posted in Collaboration, Otome Games, Sengoku Night Blood and tagged Kadokawa, Marvelous!, Mobile, Otomate, SNB Takakage. Having heard that Takakage-san was seriously injured in a battle, I hurried over to his room with anxiety. 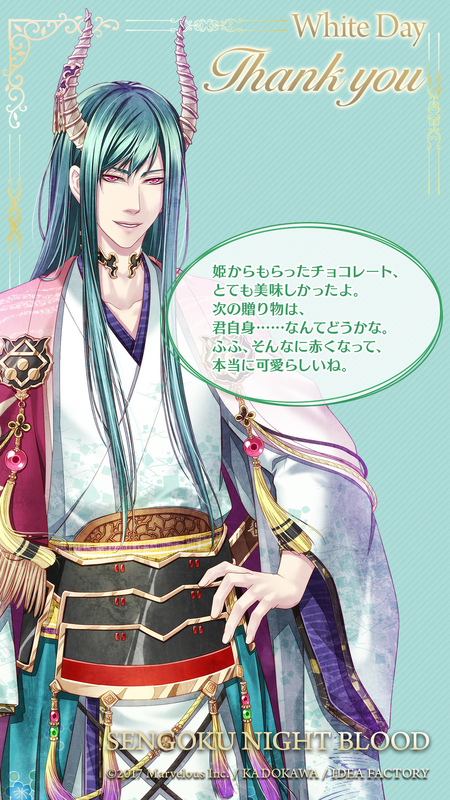 This entry was posted in Collaboration, Otome Games, Sengoku Night Blood and tagged Kadokawa, Kawanishi Kengo, Marvelous!, Mobile, Otomate, SNB Takakage. “The chocolates from my princess were very delicious. For the next present, how about… you yourself? And last but not least the mysterious (and slightly ominous) Mouri Army!